With backlight on and contrast set to max - sitting next to a 40w lamp - menus are unreadable. Yes, I tried a new battery. So far, Sharp support for this product is ... er ... elusive. No menuie, no usey. I'm PO'd. I am a busy pastor who constantly changes hats and needed a better system to stay organized. The Sharp OZ-590A did the job. The calendar allows you to schedule appointments. By writing the appointment time for 15 mintues before the acutal appointment and setting the alarm beeper, it is a great reminder. It has a clock, and lets you write "to do" lists. The enclosed softward makes it easy to synchronize Sharp OZ-590A with Microsoft Outlook. 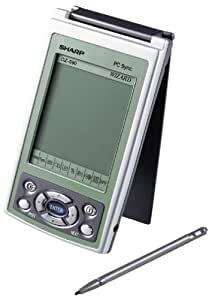 You can write a list of addresses and phone numbers with the mini-keyboard on the Sharp OZ-590A or using your computer with Microsoft Outlook. By connecting the Sharp OZ with the enclosed cable to your computer, the two will synchronize one another. If you have a Mac, I do not think this would work. The only drawback is that sometimes after synchronizing it freezes up; this is remedied by removing and then replacing the battery. It takes a second. Then you have to check to the clock. If you do not do this quickly, you might have to reset it. This really does the job for me. It is smaller than palm pilots. It's great to have all the addresses and phone numbers you want on your person, to be able to schedule appointments and set reminders. This is a good deal. The used, reconditioned version is even a better deal if they are still available. Not easy to see text, display is dull. Contrast control has limited range. You can not maneuver around the menu's content easily. The CD that came with the product failed to register with Windows 7. I didn't expect much from this PDA, considering the cost. I just wanted to record some memos. I haven't tried syncing it up to Outlook or anything that complicated. If you think of it merely as just a handy tool to quickly jot down notes, you won't be disappointed. I suspect, from the complaints I've seen about it, when people paid the full price and expected to download emails from Outlook, that's where the product faltered fro them. In all honesty, it would make a great gift for a 10-12 year old. It's impressive looking, but the price ($12.99) can't be beat...just don't expect too much from it.